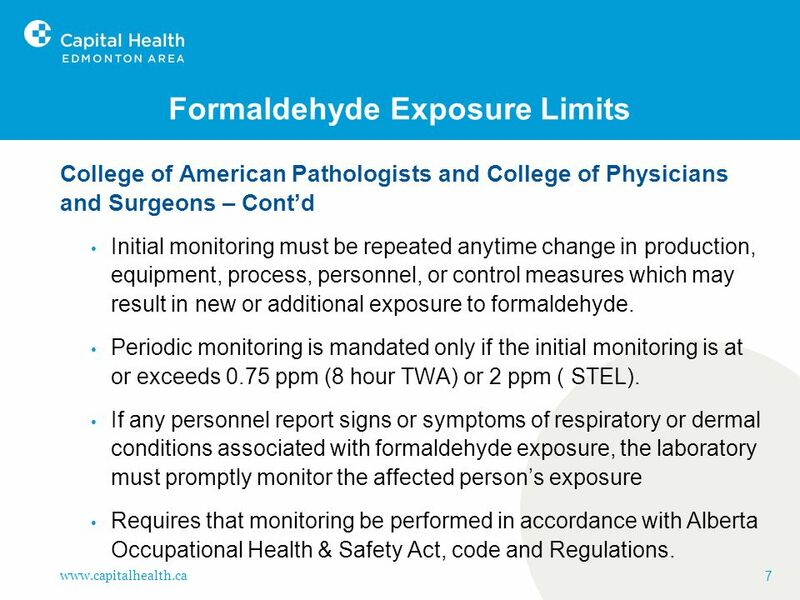 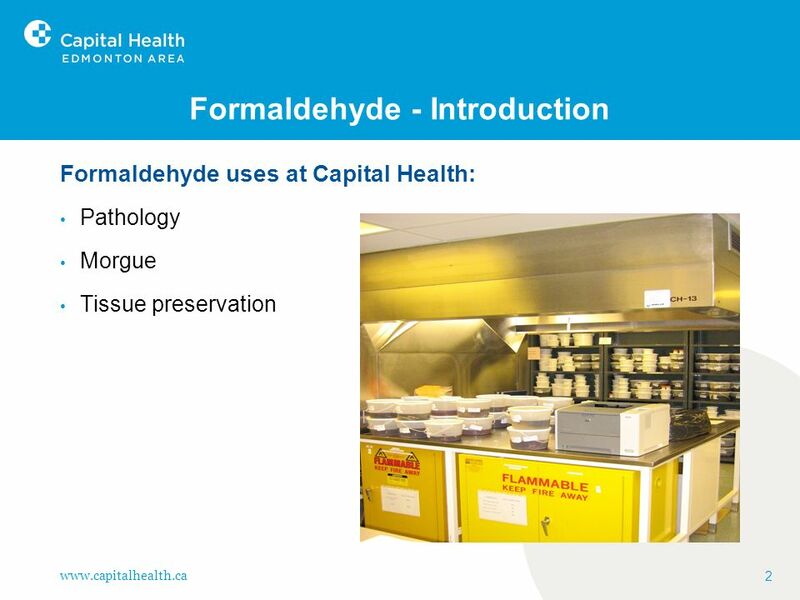 College of American Pathologists and College of Physicians and Surgeons – Cont’d Initial monitoring must be repeated anytime change in production, equipment, process, personnel, or control measures which may result in new or additional exposure to formaldehyde. 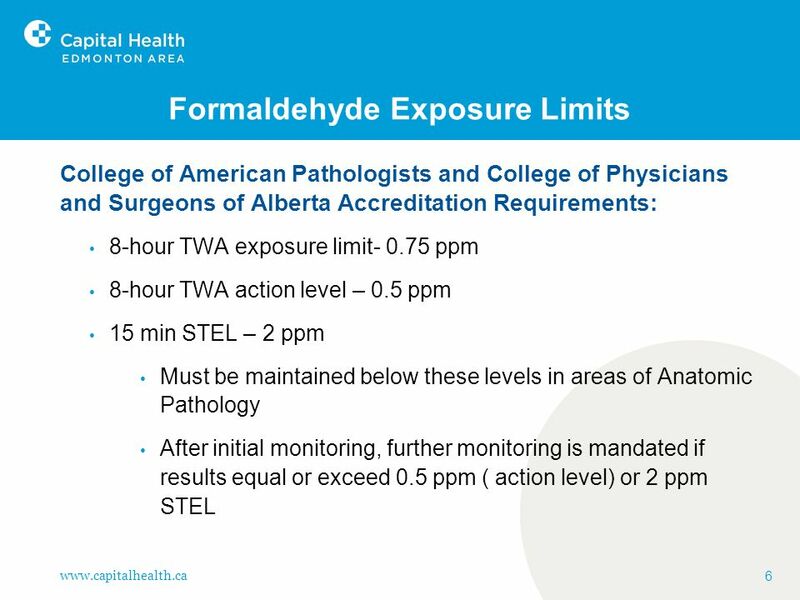 Periodic monitoring is mandated only if the initial monitoring is at or exceeds 0.75 ppm (8 hour TWA) or 2 ppm ( STEL). 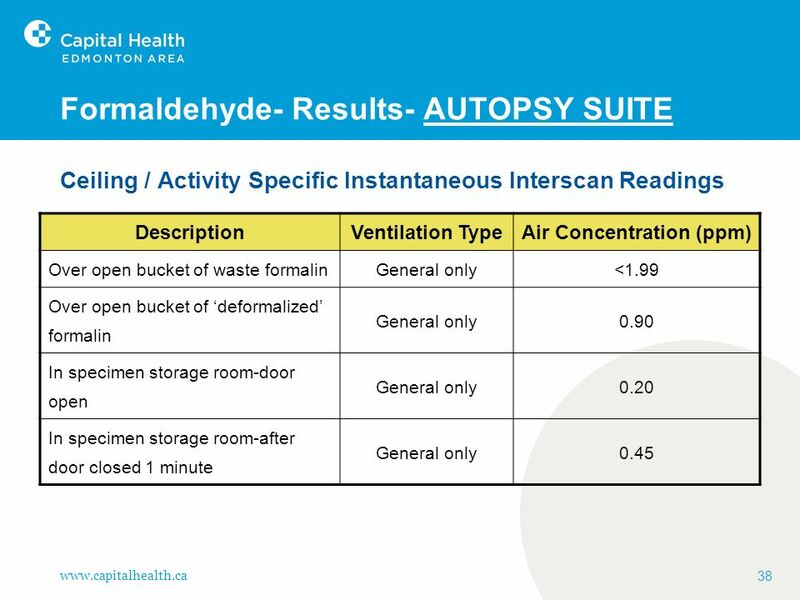 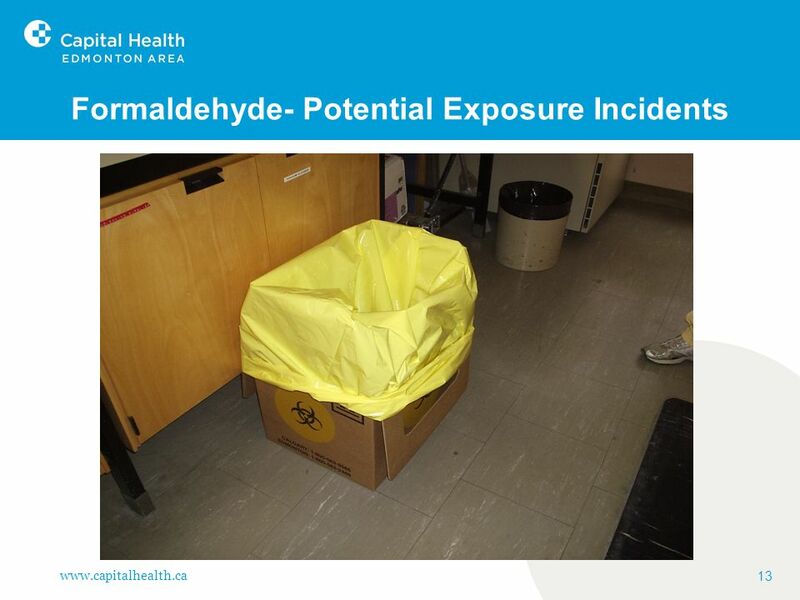 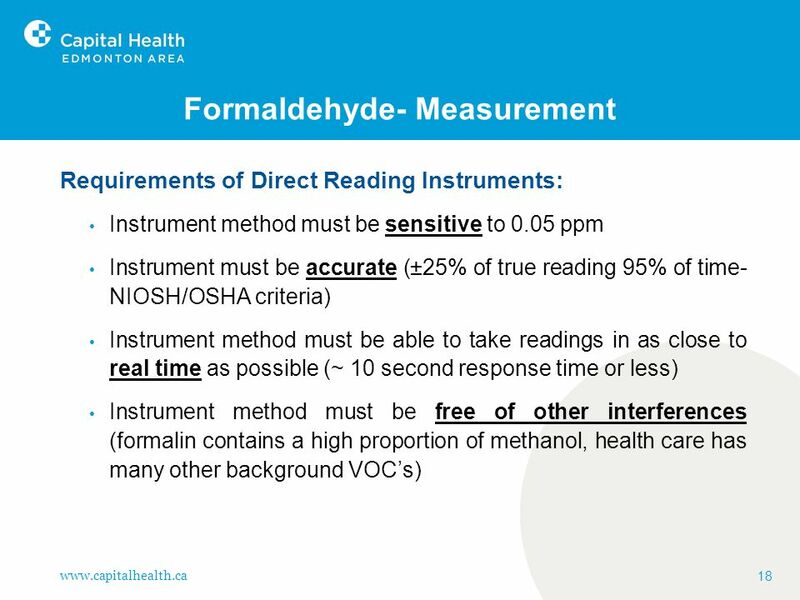 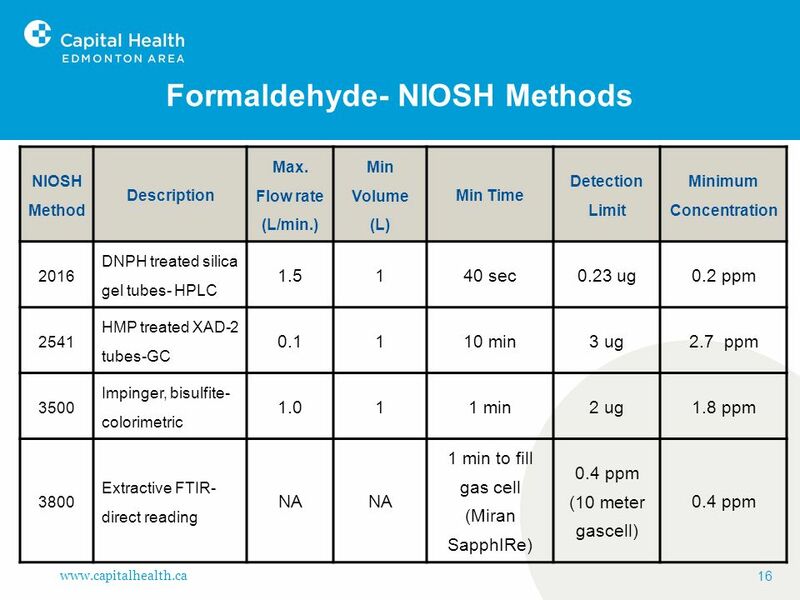 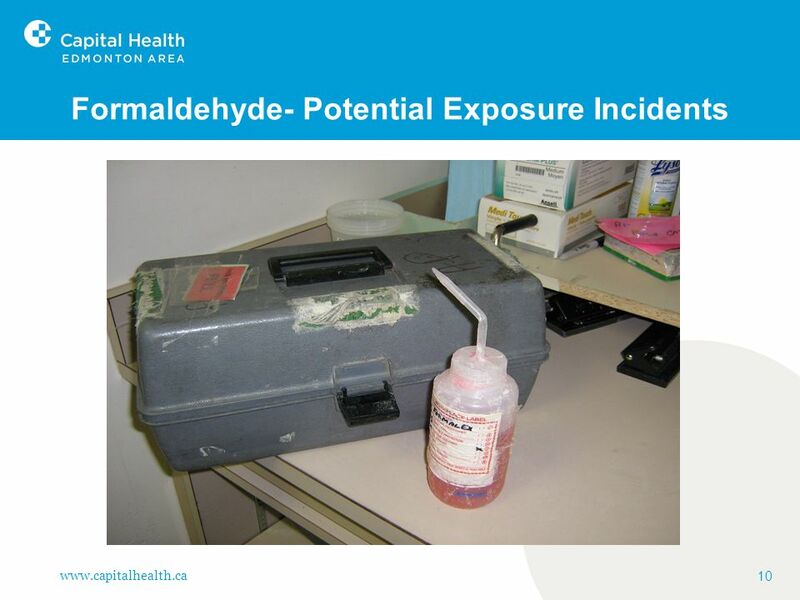 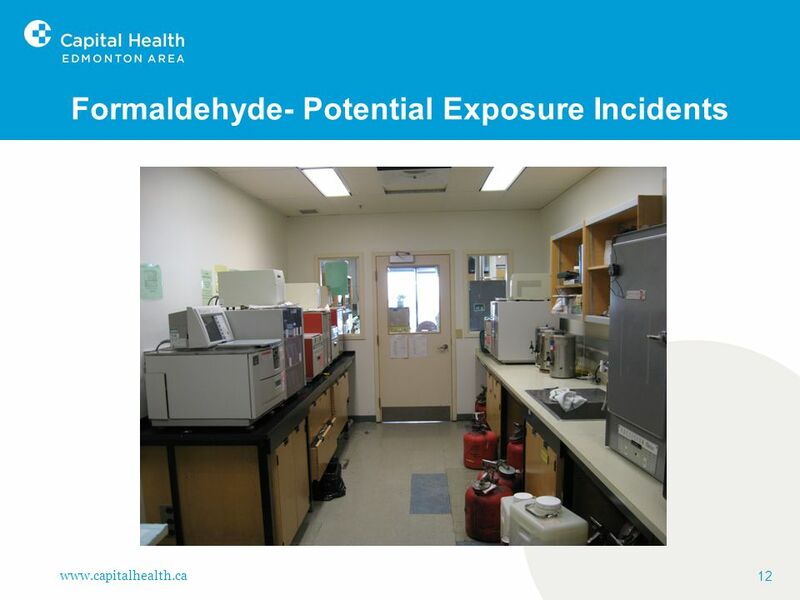 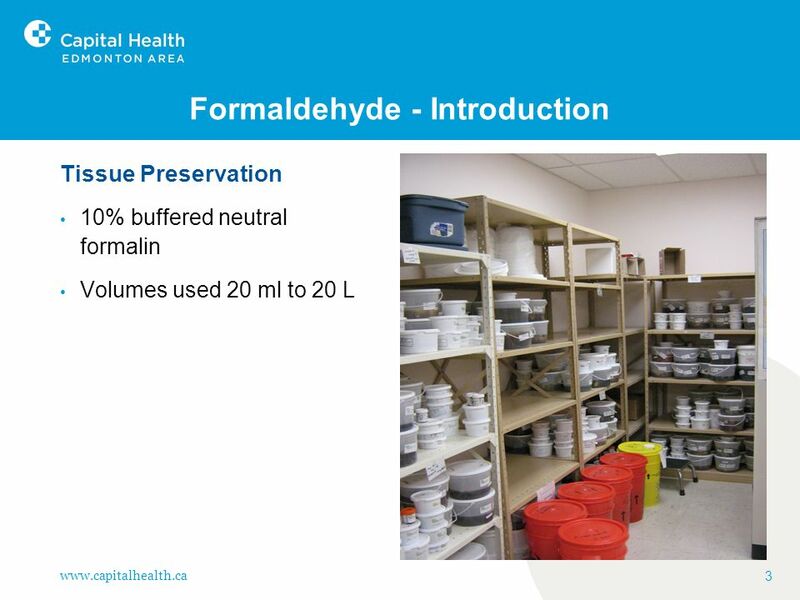 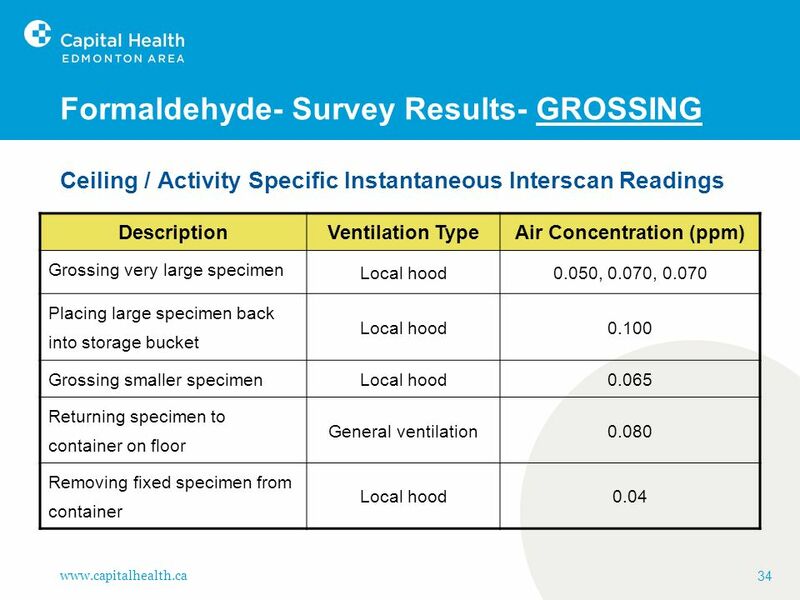 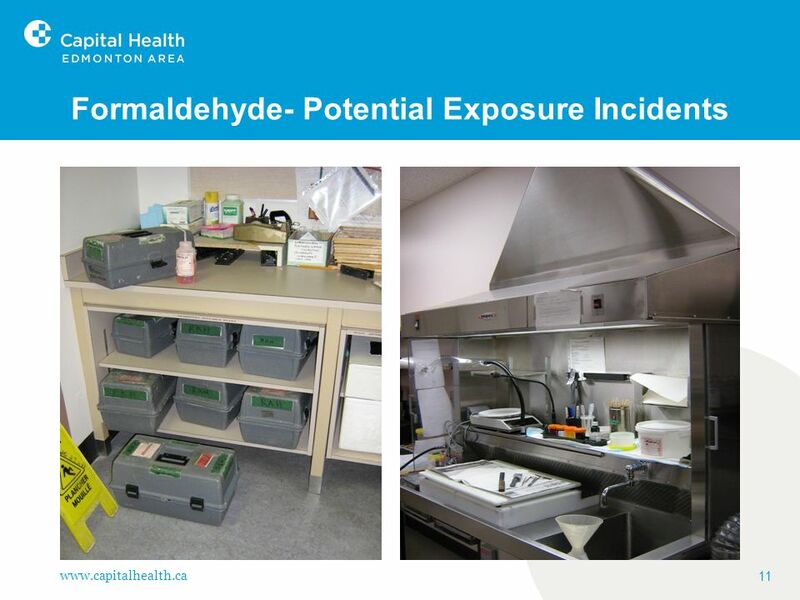 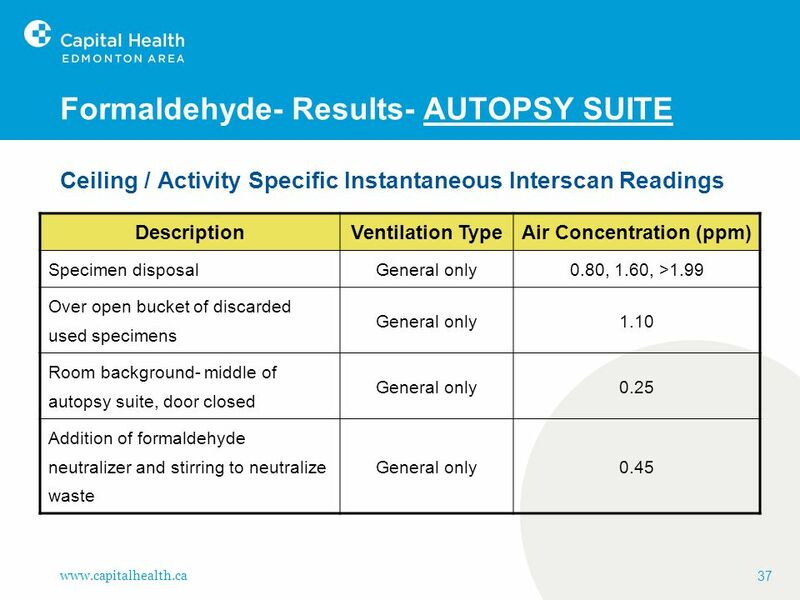 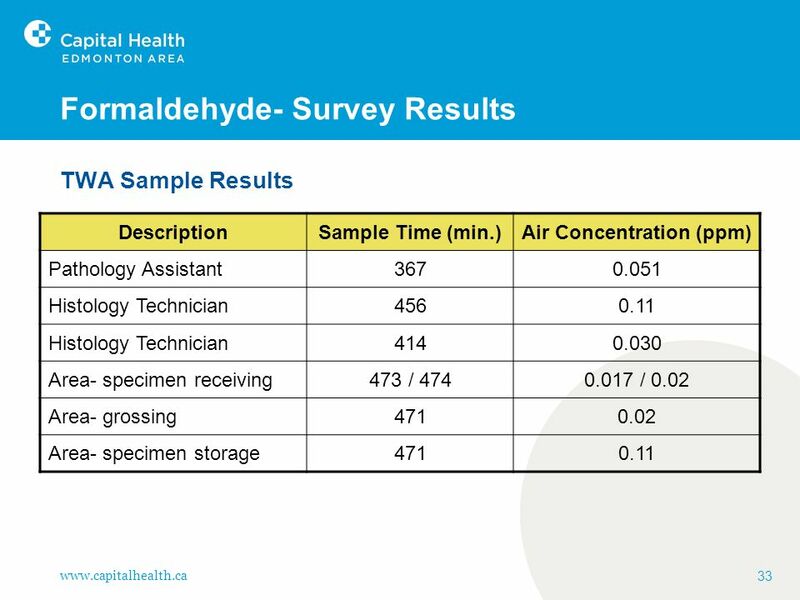 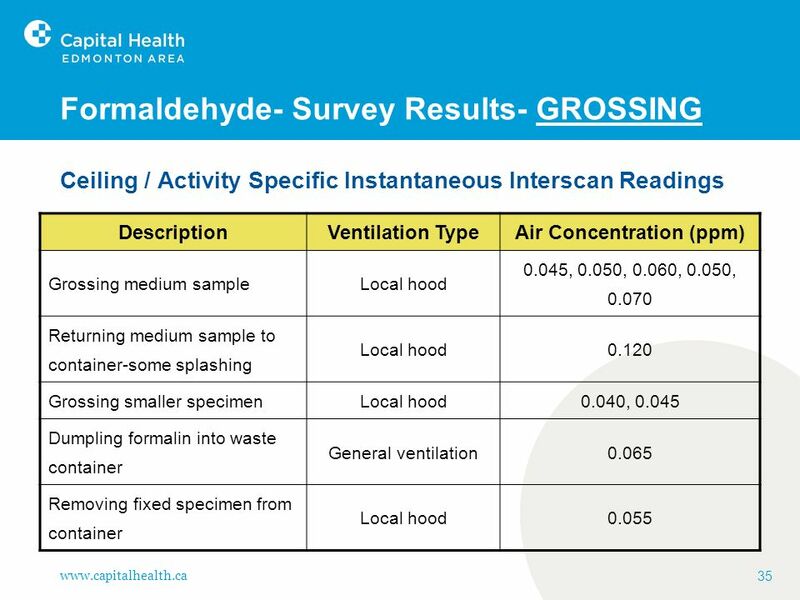 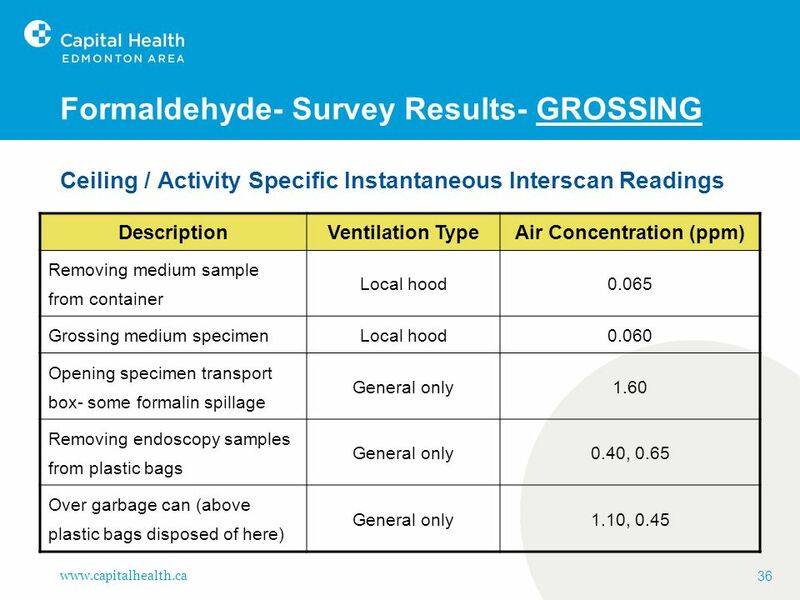 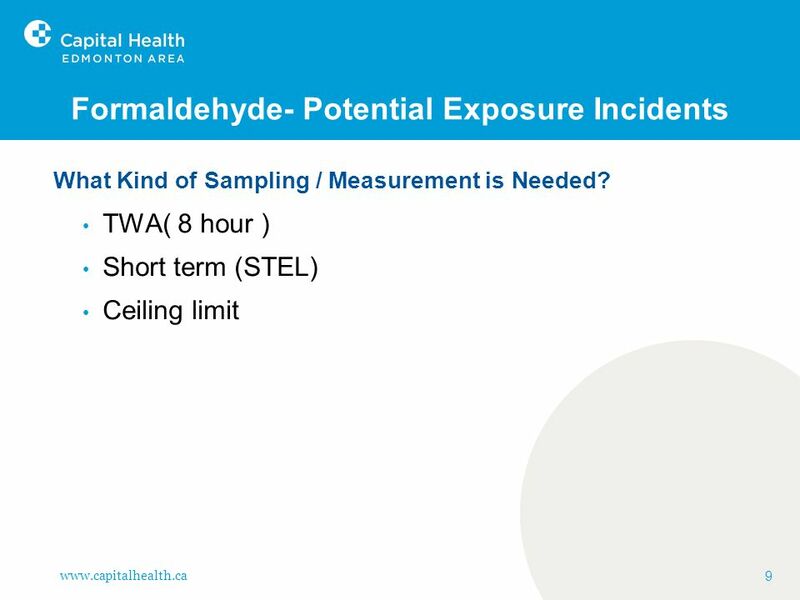 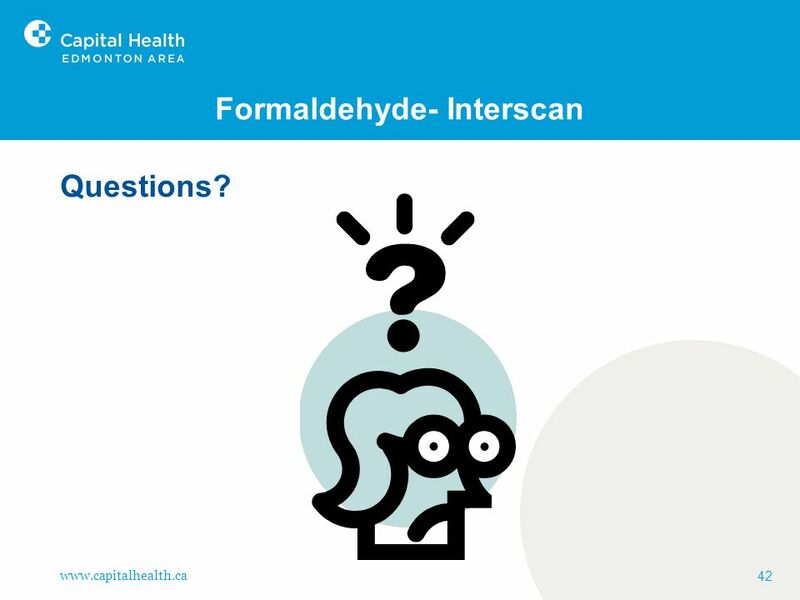 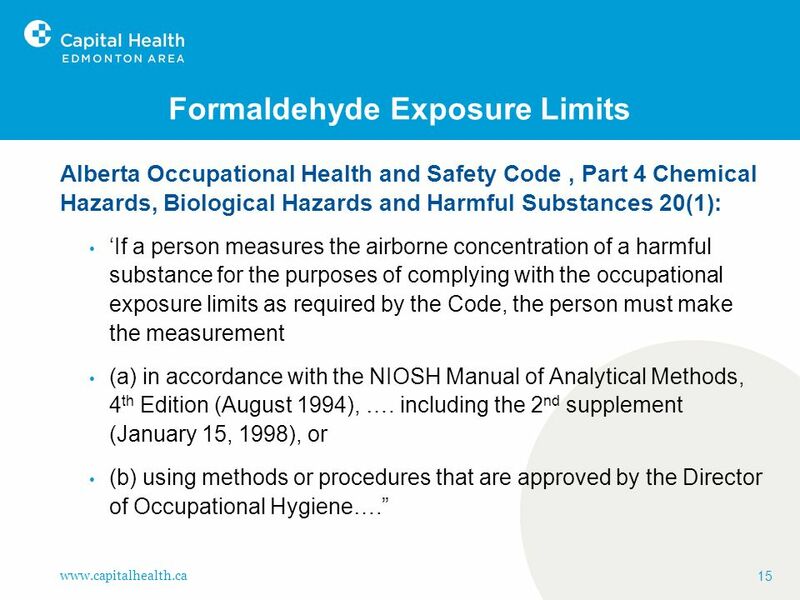 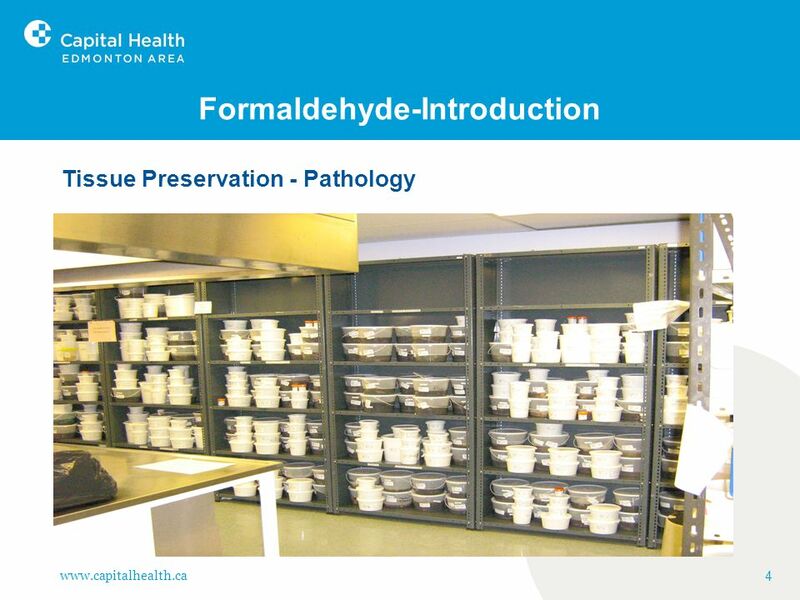 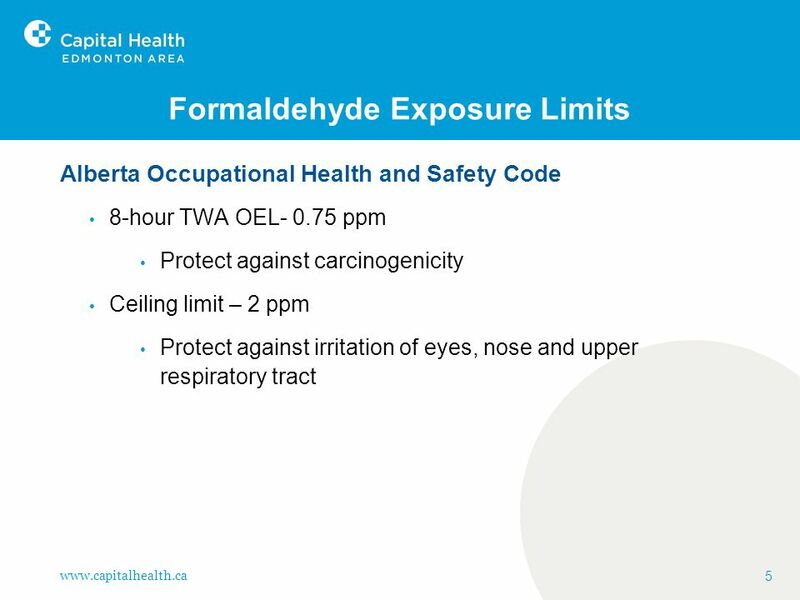 If any personnel report signs or symptoms of respiratory or dermal conditions associated with formaldehyde exposure, the laboratory must promptly monitor the affected person’s exposure Requires that monitoring be performed in accordance with Alberta Occupational Health & Safety Act, code and Regulations. 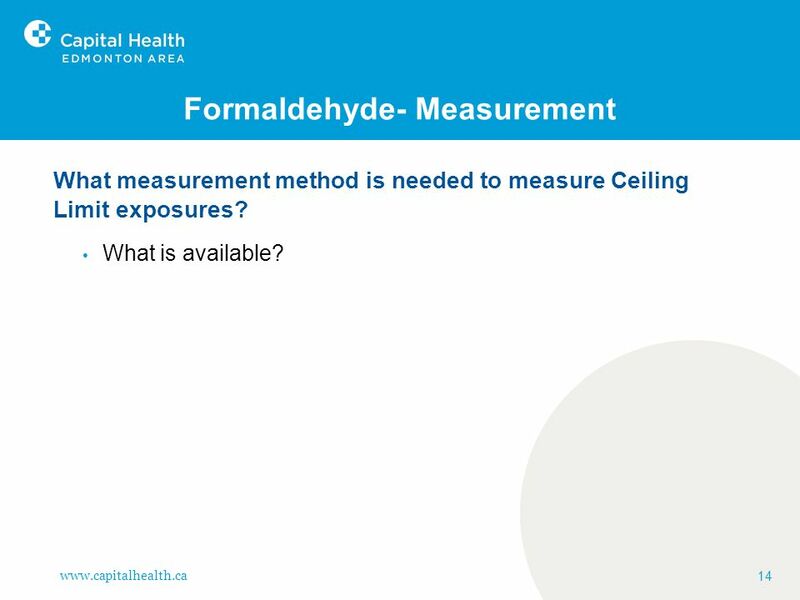 What measurement method is needed to measure Ceiling Limit exposures? 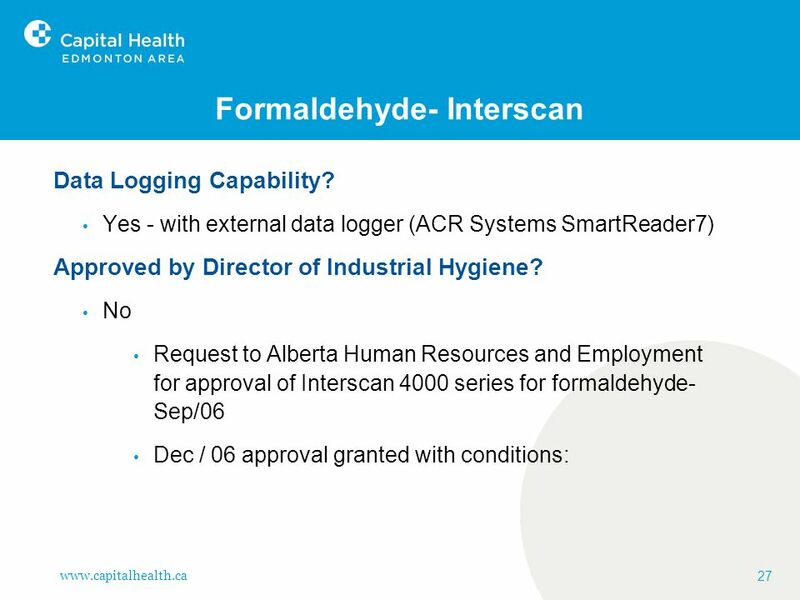 What is available? 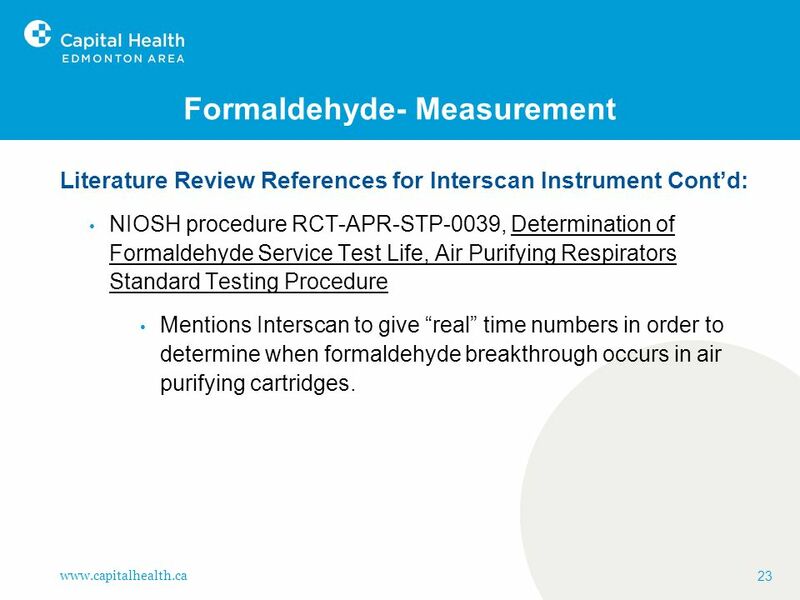 Literature Review References for Interscan Instrument Cont’d: NIOSH procedure RCT-APR-STP-0039, Determination of Formaldehyde Service Test Life, Air Purifying Respirators Standard Testing Procedure Mentions Interscan to give “real” time numbers in order to determine when formaldehyde breakthrough occurs in air purifying cartridges. 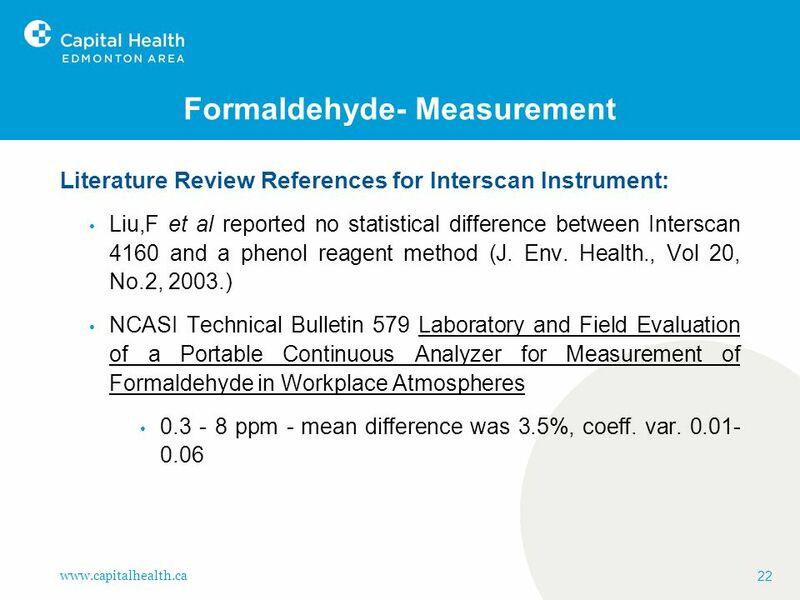 Literature Review References for Interscan Instrument Cont’d: US EPA Final Report IE 2814 Residential Indoor Air Formaldehyde Testing Program: Pilot Study Used Interscan for real time formaldehyde measurements in conjunction with integrated sampling methods for building material off-gassing testing. 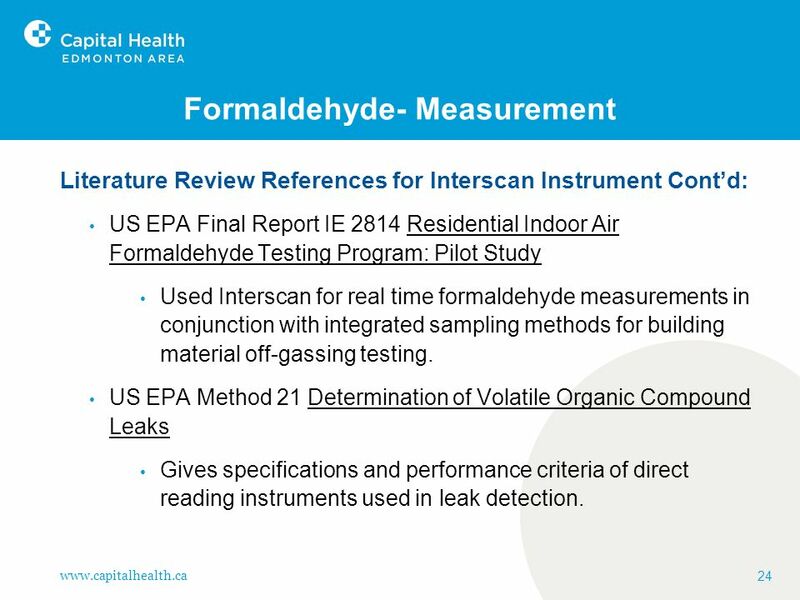 US EPA Method 21 Determination of Volatile Organic Compound Leaks Gives specifications and performance criteria of direct reading instruments used in leak detection. 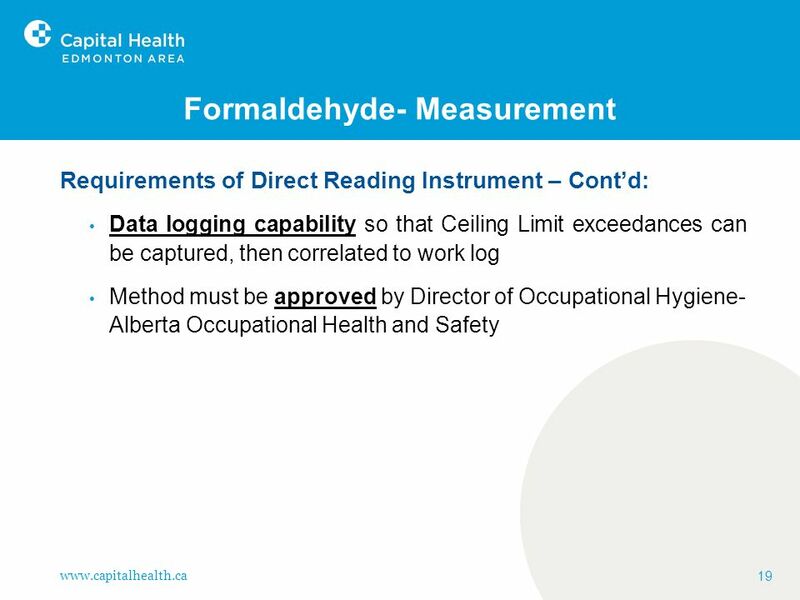 Conditions: Specific to Capital Health facilities Normal calibration is done at least quarterly when performing according to specifications within 35-65% RH. 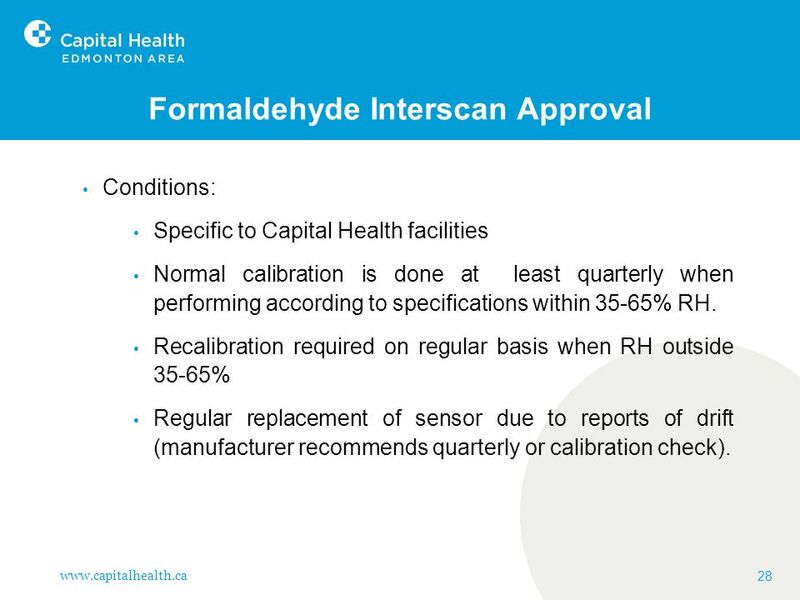 Recalibration required on regular basis when RH outside % Regular replacement of sensor due to reports of drift (manufacturer recommends quarterly or calibration check). 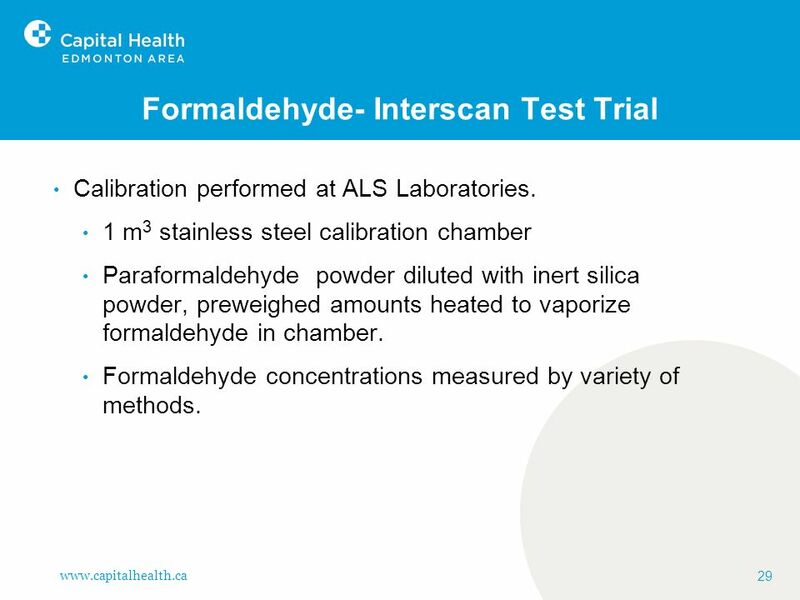 Calibration performed at ALS Laboratories. 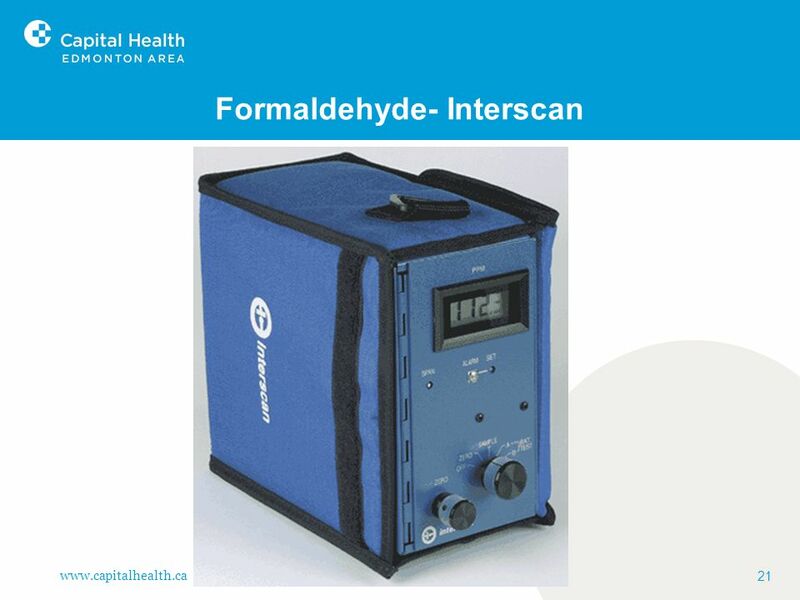 1 m3 stainless steel calibration chamber Paraformaldehyde powder diluted with inert silica powder, preweighed amounts heated to vaporize formaldehyde in chamber. 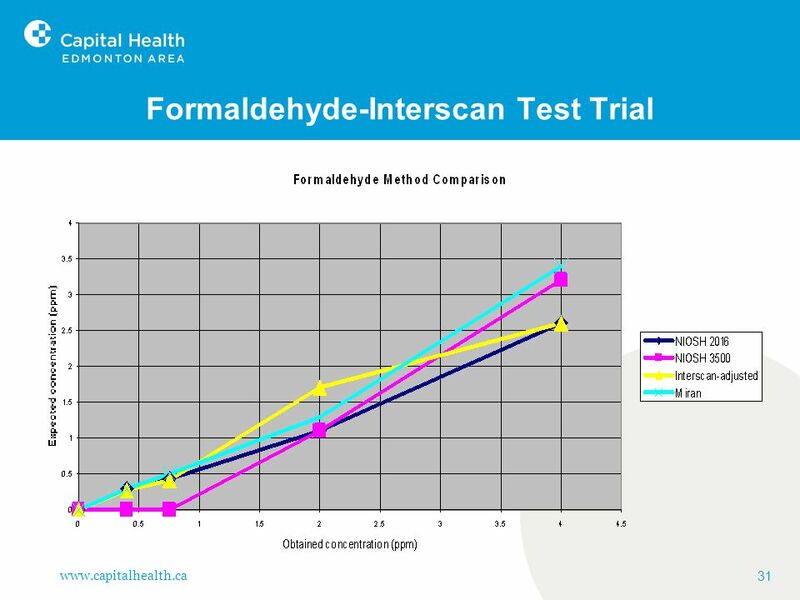 Formaldehyde concentrations measured by variety of methods. 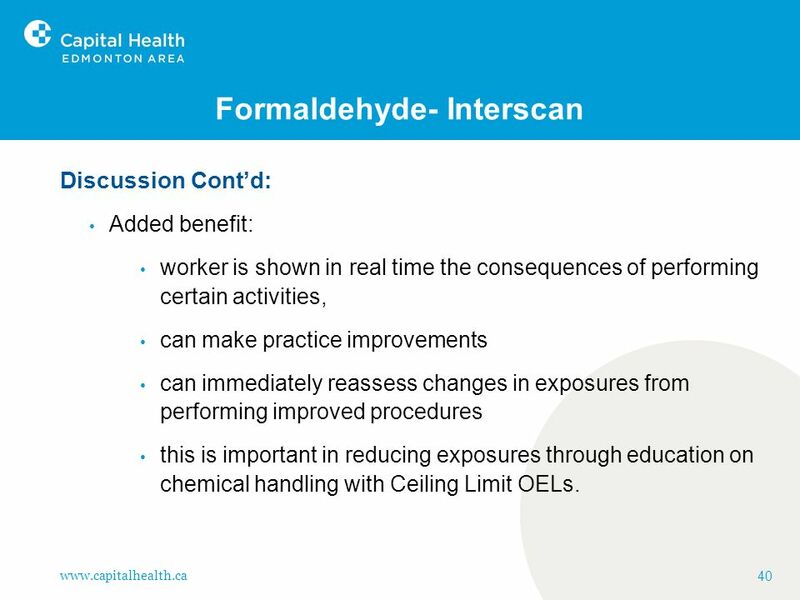 Discussion Cont’d: Added benefit: worker is shown in real time the consequences of performing certain activities, can make practice improvements can immediately reassess changes in exposures from performing improved procedures this is important in reducing exposures through education on chemical handling with Ceiling Limit OELs. 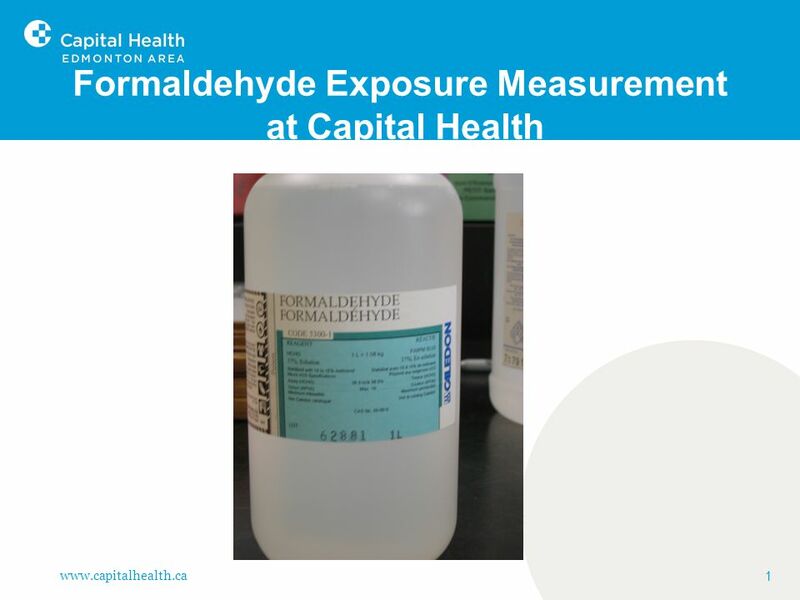 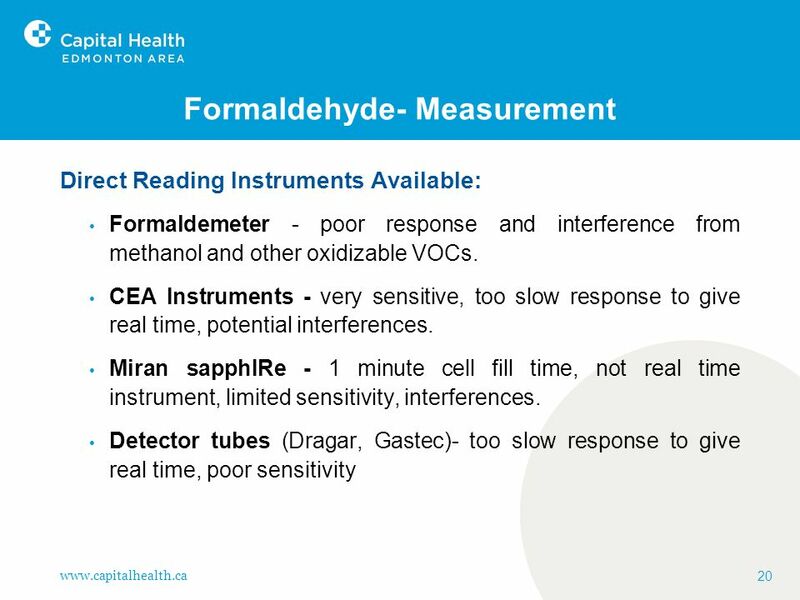 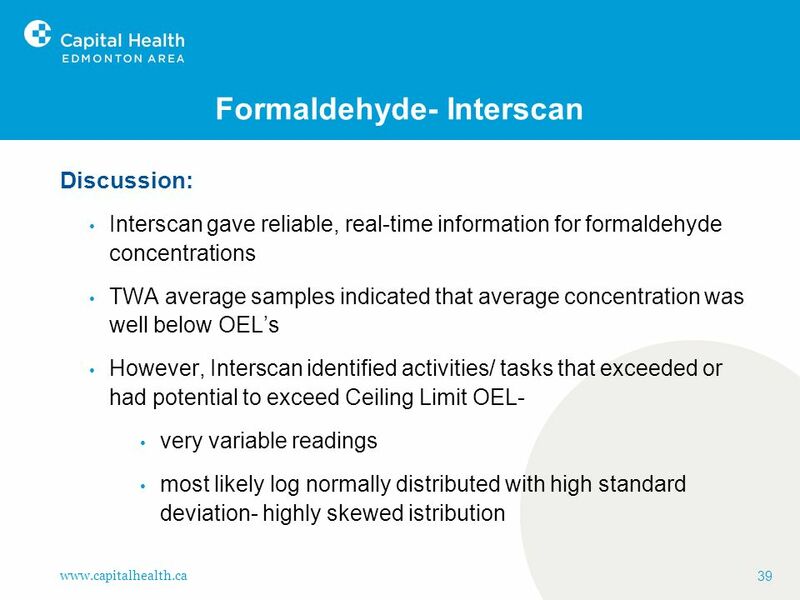 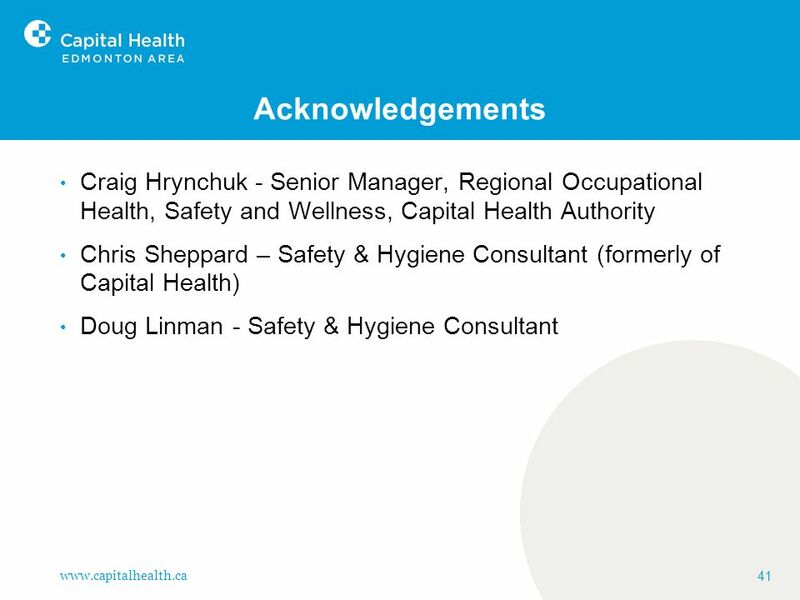 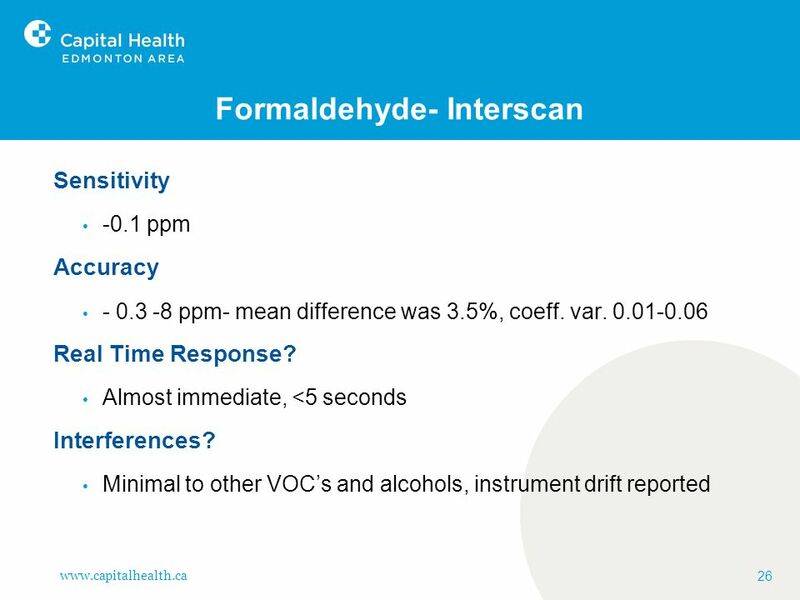 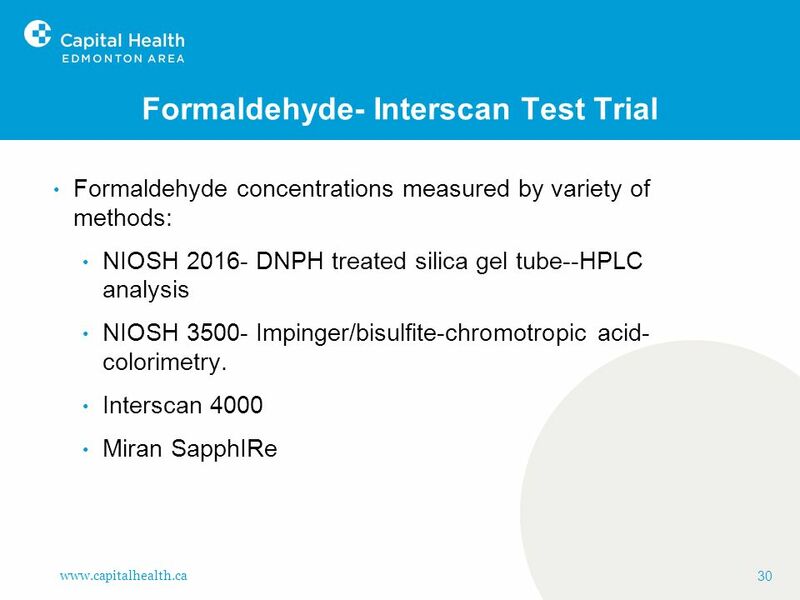 Download ppt "Formaldehyde Exposure Measurement at Capital Health"
EtO MONITORING REQUIREMENTS EtO MONITORING EQUIPMENT Michael D. Shaw Presented By. 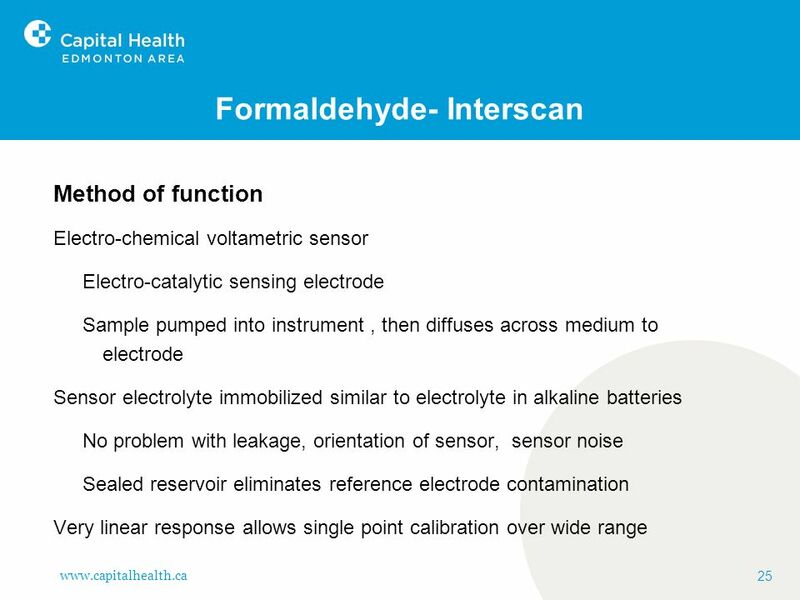 Monitoring Equipment and Detection Devices Chapter 14. 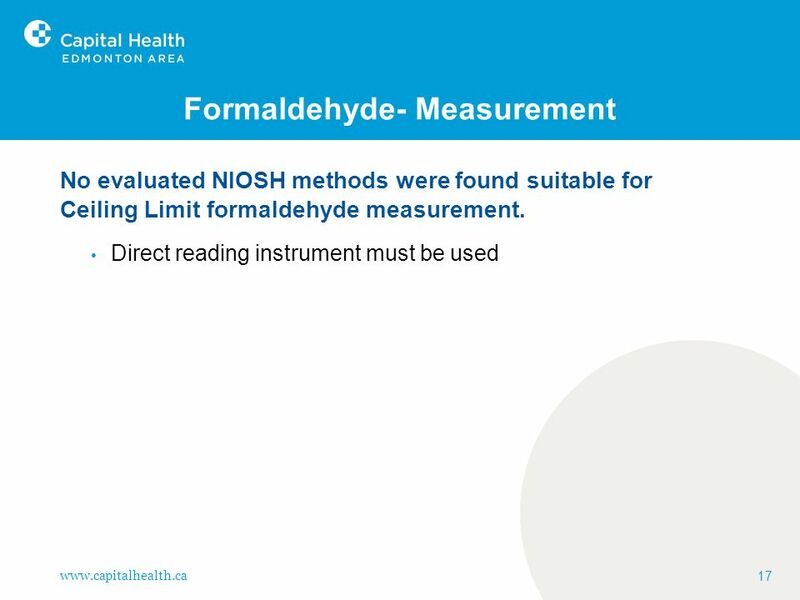 An innovative tool for the review of health and safety work practices and the implementation of effective controls of particulate exposures. 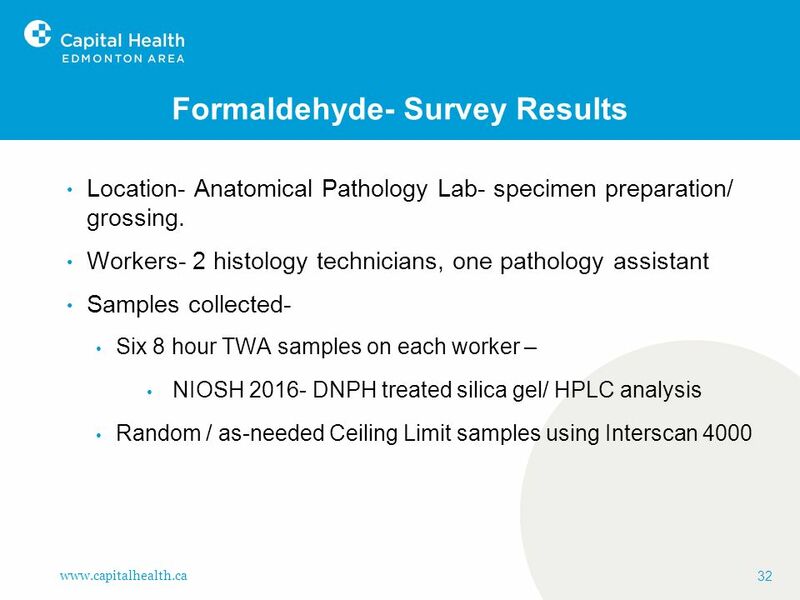 Health Hazard Evaluations of Worker Exposures During Cement Tile Roofing Operations Ronald M. Hall, MS, CIH National Institute for Occupational Safety.